The Lord Sensing Stellar Technology range of general purpose Subminiature Load Cells offers rigid welded stainless steel design, shock and vibration resistance and excellent accuracy and stability, just like its bigger relatives, all in a smallest package available at Rhopoint Components. Standard options are available in a range of load ranges, although the design can be customised to your requirement with many selectable features and options - Contact us to discuss. The VLC856 General purpose subminiature compression load cell series from Stellar Technology, offers maximum load range from 10lbs to 1k lbs with an accuracy of ±0.5% BFSL. These load cells are designed for applications requiring very small size, very little mass and rugged construction. The VLC856 from Stellar Technology are constructed from all welded stainless steel, with bonded foil strain gauged force sensors which provide reliable performance for demanding applications. Operating temperature range of −40°F (-40°C) to +250°F (+121.11°C) and each unit has a 5 point calibration record traceable to NIST as standard. The VLU850 General purpose subminiature tension or compression load cell series from Stellar Technology, offers maximum load range from 10lbs to 1k lbs with an accuracy of ±0.5% BFSL. 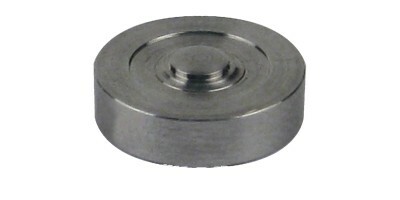 These load cells are designed for applications requiring very small size, very little mass and rugged construction. The VLC856 from Stellar Technology are constructed from all welded stainless steel, with bonded foil strain gauged force sensors which provide reliable performance for demanding applications. Operating temperature range of −40°F (-40°C) to +250°F (+121.11°C) and each unit has a 5 point calibration record traceable to NIST as standard.